Recently my dog suddenly became semi-paralyzed. I have noticed that he used to have hind legs that sometimes shake involuntarily more than a year ago. He could not stand up to walk and was literally crawling on all fours to move from one area to another. Previously about 2 months back the same thing had happened to my dog. I had taken my dog to the vet who provided conventional treatment- injection for the nerve, antibiotics and medicine to treat the inflammation. The problem came back again- I woke up one day to find that my dog could not get up on his 4 hind legs. At first he could at least crawl around but gradually he had difficulty moving. My poor doggie was yelping constantly which I did not know what he wanted. My dog weighed about 20kg and it is not advisable for me to drag him around as it would hurt my back. It was while trying to purchase a harness from a pet shop that the owners recommended that I take my dog for acupuncture treatment for a more permanent solution. Established pet shops usually know a lot of contacts and one of the owner recommended a vet clinic that provided acupuncture treatment. We took our dog to try out acupuncture treatment. At first, the vet suggested that we obtained an Xray so that it is easier to identify the cause of the issue and also to determine if there is any fractures. Acupuncture needles were applied to my dog, on his forehead, back, front and hind legs for 1 hour. At heat lamp is being placed on his upper body for 30 minutes, followed by his lower body for 30 minutes. I did ask the vet why did my dog yelped and was told that when the dog suddenly find itself paralyzed and helpless, it may develop depression. The vet also advised that it would require more than one treatment to see the effect. Some dogs get better but some take up to 2 days. She mentioned after acupuncture sometimes the dog seemed lethargic and would be resting for about 2 days- something not to be worried about. 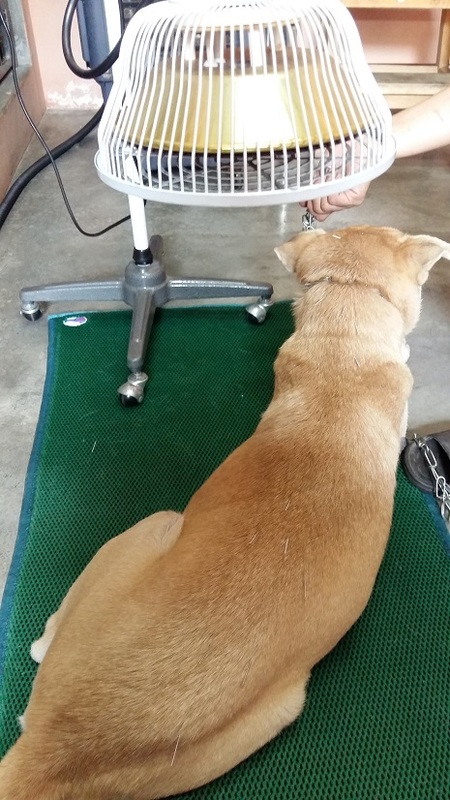 The dog also cannot be bathed for the next 2 days as it would result in the acupuncture effect being worn off. At the clinic, he was also given with an injection for his nerve, but the vet made a few injections at his acupoints. An appointment was set in another week’s time. He is also being prescribed with medication- Chinese medicine, medicine for inflammation and medicine for nerve. Right after treatment, I noticed my dog was more alert and was able to crawl around when he previously could not even crawl. I fed him medicine twice a day as prescribed by the doctor. We went for the second acupuncture treatment. This time, the vet also advised for my dog to take tick medicine orally. I went back and feed my dog with his usual medicine as well as the tick medicine. Lo and behold! The next morning, I woke up being pleasantly surprised that my dog was able to walk, even though it was unsteady and weak but at least he could get up. We have been keeping pet dogs from as young as I could remember. In fact, I do not remember any period in my life where I went without any pet dogs. However, none of my dogs ever developed paralysis similar to what my current doggie is experiencing….hence this experience is very new to me. In fact, I have 2 pet dogs now- both are fed with the same food and received the same treatment for ticks but the other dog did not have any paralysis issue. Prior to this, I have treated my dogs with tick application (the type where you applied at the nape of the neck) and tick spray. 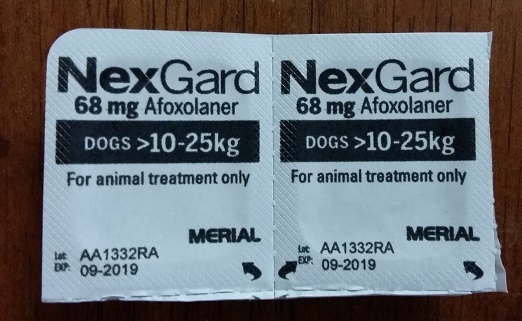 However, I find the oral tick medication, NexGard to be the most effective, even though it is also the most expensive. 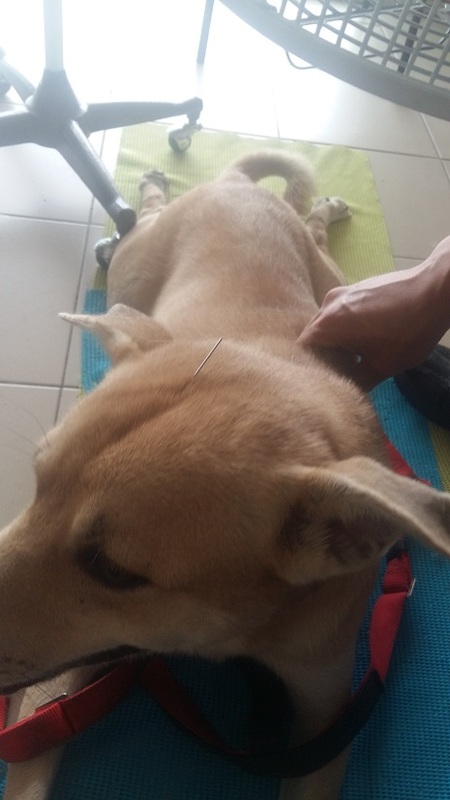 However, as my dog is susceptible to paralysis, acupuncture treatment would help to balance his body and enable him to heal from the inside instead of just treating the symptoms. If I were to just treat my dog using conventional medicine, he may just go into another paralysis after 2 months. 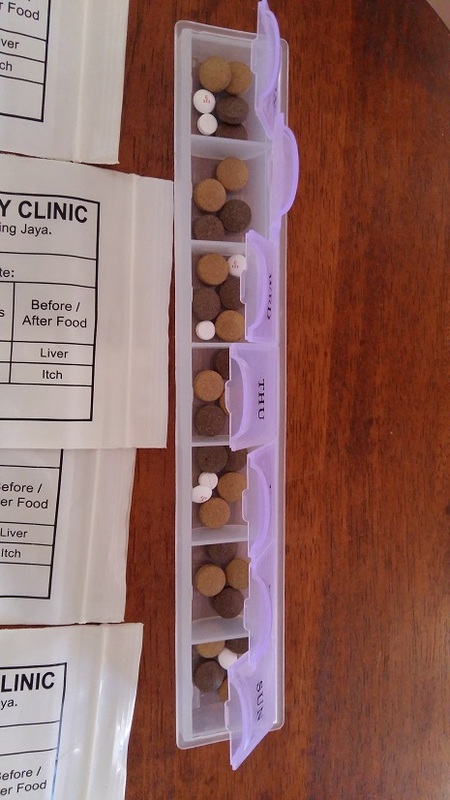 The vet advised me that my dog also have to continue to take the Chinese medicine being prescribed on long term basis. The purpose of the Chinese medicine was to bring up his ‘yang chi’ to strengthen his kidneys. The vet said my dog’s condition is not because of the need for glucosamine for his joints but because he just could not get up. Acupuncture and Chinese medicine are definitely effective to treat any nerve weakness issue. One of the pet shop have shared with me that she had a customer with a cat who met with an accident and was paralysed. The cat was healed with about 12 course of acupuncture treatments. Prior to finding the option for acupuncture, the customer had spent 4k on conventional treatment without any effect. The pet shop owner also had similar experience where her own pet dog had a structural weakness- the dog seemed weak when going up the stairs and sometimes nearly tumbled and fell over which can be dangerous. She also took her dog for acupuncture treatment but she mentioned it requires about 6 courses for her dog to be able to walk properly.